So, every year I like to do some gift guides. Usually I start before December, but I'm just getting around to it this year. 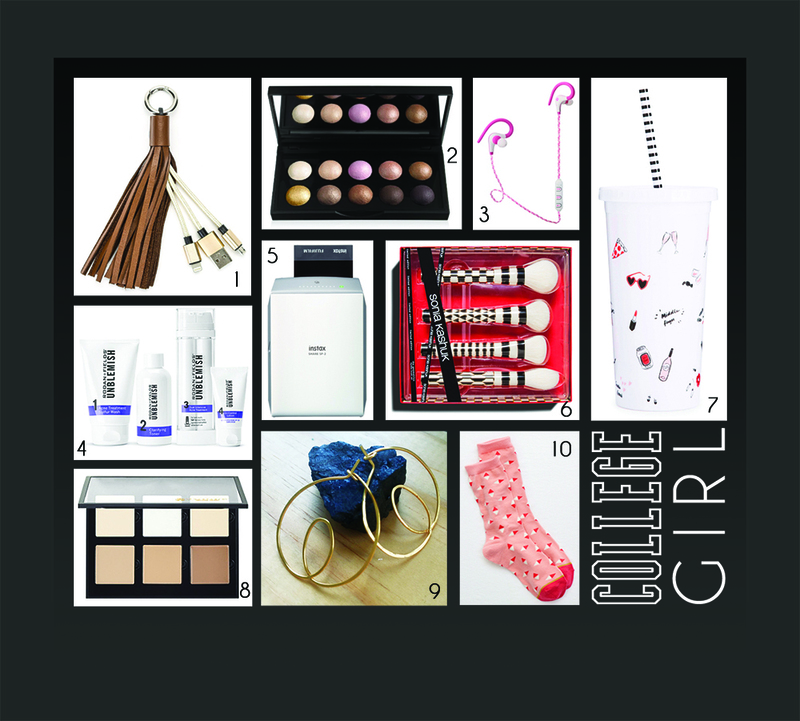 Today's gift guide is labelled "College Girl," but I think it could be for any young lady in your life. So let's talk about what's on the list. If you're not giving this to a college girl, give it to your coworker who's always asking if anyone has a charger. She can clip this on her keys or purse and never have to ask again. So, the link I have here is from Amazon, but you can also get this palette at Target and lots of drugstores. It's inexpensive, but I use this kind of eyeshadow, and I think it's great. Now that iPhone has forced the world into the age of the wireless earbud, why not get everyone on your list a spare pair. It seems like wireless earbuds are going to be easier to lose, so just add this to your shopping list for the next few years until they implant headphone chips in our bodies. Ok, so this is expensive, yes. And before you get mad, I'm not a Rodan and Fields Rep, and I don't even know the name of the person who sold this to my mom to give to me. What I do know is that it totally works, and it's great. So...if you think your college girl gift recipient would like clearer skin or just some nice smelling face stuff, this might be excellent. Side note: if she does have bad skin, DO NOT make this about how bad you think her skin is. Chances are, she knows, and she doesn't need to be told. Just saying. Many a friend has made this complaint to me about well-meaning loved ones. Don't be that person. Ok, my parents gave me one of these for Christmas last year, and I love it. You connect to the printer via the bluetooth on your iPhone, and you can print any photo on your phone onto that cool instax instant film. Love. It. I have no idea how these brushes actually feel, but they're so cute. These would make anyone's bathroom counter look so fancy. So, I love these things. I drink out of these when I work out, when I'm working at my desk, and when I'm on the road. Currently, I have two that I love plus two that are pretty good. I think they're magical. The only thing that would make them better would be if they were actually dishwasher safe. I still put them in the dishwasher, though. They seem fine..but maybe my dishwasher is just weak. I purchased this kit a while ago, and while I'm not a makeup maniac like Kim or Kylie, I quite enjoy this thing. It's a fun thing for the girl who likes to try things but would never purchase something like this for herself. These are cute and easy to wear. a great staple for the school year...or the work week...or a night out...or church. They're very versatile. If you've been looking at my gift guides for any period of time, then you know socks are one of my go-to gift items. Who doesn't need some fresh, clean socks? I think these are cute, and Aerie socks are also really soft. Welp. That's it for today. Happy Tuesday!